This is one of two apartments we have, the other being a two bedroom apartment in the same building. 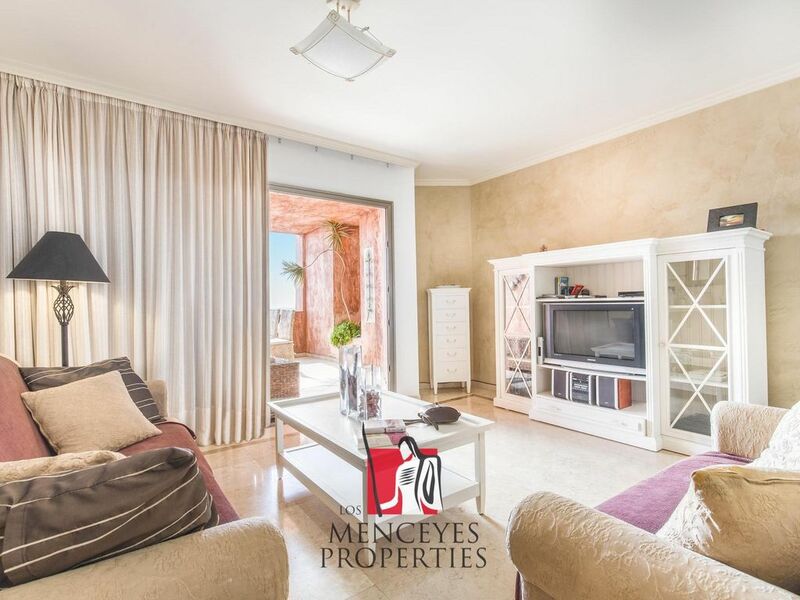 This one is a large 99sqm luxury apartment located just 150 metres from the sea, 15min from the South Airport and only 5/6 miles from Los Cristianos/ Las Americas. This area is perfect for a quiet relaxing holiday, with plenty to do and a choice of quality restaurants within minutes. We have furnished our apartment with most of the luxuries of home with particular attention to comfort. The master bedroom has a very comfortable Super king size (6ft Wide), Bed and in the lounge there are two quality sofa beds, one King size and one single. Other luxury qualities: Rooftop pool with fantastic views, Private underground parking space, Lift to all floors, Luxury En Suite Jacuzzi bathroom, with separate shower & twin basin vanity unit. A fully equipped Kitchen with, ceramic hob, oven, dishwasher, microwave, Granite worktops, washing machine, Generator Steam iron, ironing board. For your entertainment a 40 inch flat screen TV, Quality Music System. DVD Player with over 100 DVD's, Hairdryer, Hair straighteners. Marble floors throughout. There are five Golf Courses within 20min. The Seafront: The seafront is only a two minute walk away and has a promenade which lines the beach for over a kilometre. The nature reserve is less than 1/2 a mile away which is a wonderful coastal walk. Smoking on rear balcony or front terrace only. Golf in South Tenerife: There are five Golf courses in the South of the Island all usually in terrific condition, quite testing with beautiful views all within a 20 minute drive. 1. Closest is the Los Palos 9 hole course which is only 2 miles away, small but plenty of challenges, which is well worth a visit in preparation for the Championship 18 hole courses. 2. Las Americas (6 miles), a 72 par course with magnificent views. 3. Golf del Sur's (8 miles), 27 hole course which has hosted many International events can be very busy and you are advised to book in advance to save disappointment. 4. Costa Adeje Golf is another terrific course which has greens with several doglegs (could be handy for that slice or hook), only 9 miles away. 5. Amarillo is the fifth course (7 miles), which is another 27 hole course besides coastal cliffs again with spectacular views. The en-suite luxury bathroom comes complete with jacuzzi bath, separate shower, twin basin vanity unit with cupboards and drawers for storage as well as a huge mirror above. The en-suite is beautifully tiled with marble floor. For those that may sleep in the Lounge there is a separate Cloakroom with toilet and Washbasin, mirror and Marbled floor. There is Free Internet throughout the apartment. We have a Multi Language Internet TV System. There is a lift to all floors. Most of these apartments are privately owned and privately used which means that the Rooftop pool is very quiet indeed and very often completely private. Security is excellent with remote control for garage parking, locks for the pedestrian gate, top quality high security multi-bolted apartment door as well as a safe in the bedroom. All that said and done this must be one of the friendliest safest unspoilt villages on the island. Only 15 min from the airport and one junction before Los Cristianos, Palm Mar is located between a nature reserve and the Guaza mountain being tranquil and serene. Los Cristianos and Las Americas are only 5-7 miles away respectively. This quiet area has very little traffic, has a number of restaurants, bars and 3 mini markets all within a few hundred yards. For the energetic the location is Ideal for hikers, horse trek riding, surfing, fishing, sailing, swimming, diving, but is also perfect for a quiet relaxing holiday and to enjoy the beauty of the Canarian coastline. Golfers can take advantage of the beautiful, quaint 9 hole Los Palos which is just 2 miles away, complete with driving range, putting green and a lovely cafeteria/bar at the entrance. Palm Mar is central to the South of Tenerife which makes almost every attraction and cultural sight within easy driving distance. In fact you can drive around the whole island in just two hours. Other Activities: Siam Water Park - Europes largest opened Nove 08, One of Europes largest Karting Tracks 10mins, Aqua park 15mins, Loro Park. In Fact there are too many attractions to list here. Have a look at a Tenerife website.